This card was made for the Ditzy Craftymess Challenge blog daily challenge. The challenge was to make an ATC, card or altered item with a motto, qoute or saying. I found this Jane Austin quote and as a big fan I had to use this for the challenge. The backing paper is from the Material Girl paper pack from COSMO Cricket matted onto some gold cardstock and adhered to a cream card base. 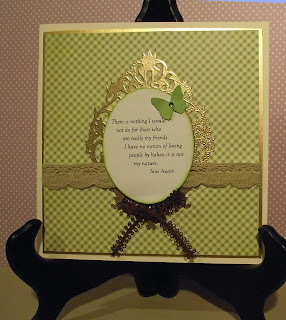 The ornate frame is heat embossed using Prima Marketing clear stamp from the Wings set using gold embossing powder. The ribbons came from my stash and the Butterfly was punched using a Martha Stewart punch. Not bad for a quick little card for the Ditzy-Craftymess daily challenge. Thanks for stopping by to read the blog. Your time and comments are appreciated.